The Golden Temple complex offers both free and low cost living accommodation in hostel style living quarters. Bookings CANNOT be made through this site (www.GoldenTempleAmritsar.co.uk). 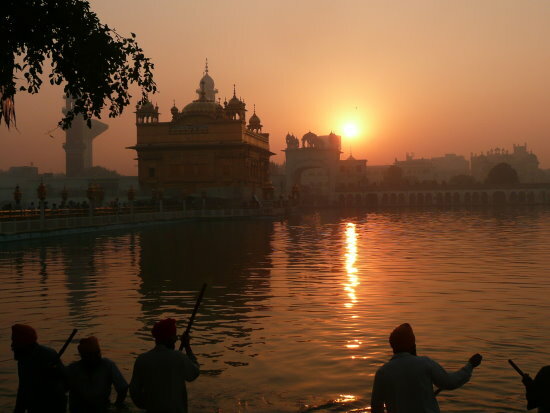 This site is here to give you the information you need to help you understand a little about where you are visiting and hopefully facilitate a pleasant stay in Amritsar. You cannot book any rooms in advance, you can reserve the room once in Amritsar via the above telephone number. Please keep in mind, these are hostel style living facilities, so sometimes the facilities such as the air-conditioning units may not work, the water may be cold, electricity may not be readily available. The rooms are cleaned and maintained by the Seva (Service) of the Sangat (people visiting the Golden Temple). Sri Guru Ram Dar Niwas is a free hostel for pilgrims and visitors built by the SPGC. There are 228 rooms and 18 large halls. The literature stays that the Niwas supplies free bedding, costs, lights and fans. Stays are mostly restricted to 3 days. Guru Nanak Niwas contains 68 rooms, 22 of the rooms have bathrooms attached. There are 10 additional bathrooms, and 10 flush latrines. Guru Hargobind Niwas contains 88 rooms with double bed and attached bath, there are also 4 halls with hostel / dormitory style living facilities. Rooms are available from Rs. 50 per day, per room. Guru Arjan Dev Niwas has 19 air conditioned, and 72 non-A.C rooms – (all are doubled bed rooms) – some rooms are en-suite. Rooms are available from Rs. 50 per day, per room. Mata Ganga Ji Niwas has 103 double bed rooms. Some do have en-suite facilities.In addition there are 14 hostel style halls. Rooms are available from Rs. 50 per day, per room. Akal Rest House will contain 46 rooms and 3 halls – these are under construction.